Even our young ones need something to keep them out of the rain, a kids umbrella is different from an adult one, the design, shape, style and even fabric used. The fabric in a kids umbrella tends to be of the cheaper type, as we don’t expect a kid’s umbrella to last a life time, they will usually lose or break it before too long. The hood for kids umbrellas are usually made from nylon or PVC, cheaper than polyester but it does the job. 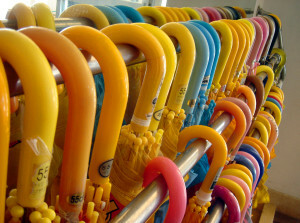 The ribs and the whole frame of a children’s umbrella is made from plastic, plastic is used for two reasons, being lightweight and being safe for kids. All the kids umbrellas I have listed on my website are manual open, so you don’t have to worry about your child’s hands getting injured when opening. The best thing I love about children’s umbrellas is the design, they tend to be full of colour have a superhero pictures on the canopy, I sometimes wish my senz windproof umbrella had a superman logo on it! The size and weight of children’s umbrellas are pretty small and light, they will weight anything from 8ounces to about 1.2lbs, easy to carry, and impossible to hurt anyone else. Depending on the age group you need for your kids umbrella, the size of the canopy can vary from 20-28inches, enough to keep a child safe and dry, but don’t expect their to be room for mommy or daddy! Children’s umbrella usually come in two versions, the first in your bog standard brolly, the second is the dome umbrella. It’s very rare to find a windproof brolly for children, usually because their is not a need in the kids umbrellas market for such a thing.